Without getting too dramatic, boundaries are a huge deal. Boundaries are what make relationships work. Talking to my private clients and group members, I notice that those of us with ADHD have very poor personal boundaries. Many ADHDers have trouble with the interpersonal stuff as it is, so boundaries become even more important for us. Lack of boundaries results in emotional instability, poor sense of self, and overall increased anxiety and stress. This leads to issues across all of our relationships – romantic, friendship, and parenting. Creating boundaries is about figuring out what types of interaction you will engage in. Boundaries allow you to communicate more effectively and take better care of yourself. 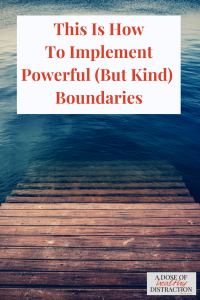 If you implement powerful but kind boundaries, everything in life will get easier. During my formative years language was used as a weapon. There are very few hurtful things someone could say to me that I have not already heard. At a young age I started to literally shut-down conversations. I did this instinctually to avoid conflict. These days, If I sense that someone is trying to engage in negative banter, I simply respond in a totally straightforward manner, answering questions without raising my voice. I do this so well that I sometimes do it without realizing it. When I was teaching, I learned lowering your vocal tone and volume can actually de-escalate students who are out of control. I had been de-escalating people without realizing it for years. First, it throws off the person who is trying to bait you. They are unable to argue if you don’t participate. Second, it draws a very firm line in the sand. A Boundary Line. I don’t do this to be unkind, I do it because it is actually nicer than the words that I want to say. I am not responding angrily or matching their tone because I don’t care to. I don’t want to hurt them even if they are trying to hurt me. You always retain the right to decide not to engage in harmful patterns of behavior or passive-aggressive interactions. Try it the next time you find yourself in a situation with someone who is attempting to pull you into something you have no interest in. Many people live (and speak) on autopilot. We answer questions with expected responses, and we perform activities without even thinking. Something inside the ADHD brain craves the safe response, “Yeah sure.” But then we also despise having to do something that is not a preferred activity. How often do you say “yes” to something, and then get irritable and angry after the fact? In order to be deliberate with words we have to commit to using words in a way that is true to who we are and the message we are trying to send. I don’t mean we should all embrace our ADHD tendency to interrupt/speak out-of-turn etc. But we should be aware that this is our tendency and try to work within that limitation. Beating around the bush will get you nowhere. And it invites misunderstanding. You do not have to plan or otherwise calculate every word that comes out of your mouth. But do take a pause sometimes before you speak. Using your words deliberately is a way of setting healthy boundaries. The big caveat for those with ADHD – try not to think out loud. I do this often and it almost always gets me in trouble in relationships. Thinking is fine, but you need to have enough self-awareness to know that other people might personalize or make meaning of your innermost thoughts. Saying no is easier said than done! Saying no isn’t just about practice, it’s about accepting that not everybody is going to like it when you say no, and getting really comfortable with that. And the people in your life might get a little upset when you start to assert your boundaries, this is to be expected. Most humans lack a sense of worthiness and we are desperately afraid that our fellow humans will reject us or stop liking us if we do not tell them what they want to hear. I have a whole speech about choosing worthiness in my Feel Better Fast Program. But in order to be able to say no and set healthy boundaries we have to know we are worthy. Since self-love and worthiness is a broad topic, I tell people to come up with a one-liner that eases them into saying the big N-O. Could I think that over and get back to you? Let me check my family calendar and let you know. I’m sorry, but I’m not available. Is there some other way I could contribute? No is one of the shortest but most powerful ways to set crystal clear boundaries. Anger is easy. Our minds leap to anger quickly and instinctually. Acceptance is harder. It takes work. But acceptance is the heart of compassion. Compassion means you are not trying to change anyone. You are accepting their behavior and feelings without judgement. How do we do this? We separate the person from their behavior. Instead of “shaming or blaming” (Brown, 18) why not focus on the behavior itself? For example, I often find myself annoyed when someone tries to force me to take responsibility for their emotions. Every so often a particular family member will try to pull me into some conflict via email. And I inevitably get annoyed with them because email is quite difficult to interpret. Instead of firing back a nasty email telling them they are off their rocker, I focus on the behavior that is annoying to me. I respond by telling them that I don’t like the way they wrote the email. I call out the behavior without labeling the person. Done. This is the compassionate way of holding someone accountable for their behavior. At some point you have to define exactly what your boundary is. Don’t assume that setting a boundary means you are cutting someone out of your life, or withdrawing from them. You are making decisions about how you will interact with the person. Keep your boundaries simple and clear-cut. For example, I decided years ago that I wouldn’t share a lot about my marriage with one of my oldest friends. I made this decision because she was struggling in her relationship, and her tendency was to try to compare and pull me into her drama. Now we don’t discuss our relationships. We discuss our friendship and our children, but not that. Keep in mind you do not have to declare you are setting a boundary. You rarely even have to tell the person. You can implement a kind boundary on your own. You do not need approval from the other person to make it work. A new boundary will improve your relationship, not end it or alienate the other person. Observe your own behavior, your own biases, and your own emotional baggage. I have a process for working through some of the core beliefs and emotional issues that come along with ADHD in my Feel Better Fast Program. When you take the time to observe your own behaviors and motivations, it becomes easier to look at the people in your life with compassion and understanding. Always assume people are doing the best they can. People do not do things just to hurt you, they do things because they are hurting. And even if they try to make it about you – it isn’t. Don’t personalize. Over time boundary setting becomes less scary and more of an act of love. Love for yourself and the people you care about. I highly recommend any of Brene Brown’s writing and research on the topic to support your efforts. Affiliate Link. Please see my full disclosure. Feel Better Fast – and take control of your emotions with ADHD! Download my ADHD Expert Database and I will send a little introduction to me and what I do.